Kismet is the commercial name for a dice game that originated in the 1960’s. 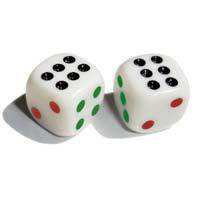 Kismet consists of five dice with coloured dots. The numbers 1 and 6 are coloured black 2 and 5 are coloured red and 3 and 4 are coloured green. To start playing Kismet, each player will take turns at rolling all five dice. A player must take up to 3 rolls per turn, aiming to create a high combination score. In Kismet, you have the option of ‘holding’ dice that you have used for a previous roll. For example, in roll two and three you can hold dice from a former roll to try and up your score count. When you have had all three turns, you must write down the score on your scorecard in an open field. It is up to each individual player to keep a note of his or her scorecard and to always ensure that the score is placed in the correct section. In Kismet, there are two sections on the scorecard, the ‘basic’ section and the ‘kismet’ section. The way the scoring works is that you score in each category by adding up the total of the dice that match it. This means that if you rolled a 1, 2, 3, 3, 4 you would score a total of 1 in the Aces section, a 2 in the Deuces section, a 6 in the treys section and a 4 in the fours section. You then add all these together and if you manage to ever score above 63 in the basic section, you will be awarded a bonus of 35 points. This is similar to Yahtzee where you also score a bonus if you can get over 63 in the Upper Section. Kismet – Five of a kind. If you roll five matching numbers on all five dice then you can claim Kismet. You then add up all the numbers on the dice and award yourself an extra 50 bonus points. Yarborough – If your dice have been rolled and don’t match any of the combinations listed here, then you are able to simply add up their face value and mark this down as your score. 4 of a Kind – A high ‘hand’. This is when you’ve rolled four matching dice numbers. You will not only get the points on the dice, but an extra 25 bonus points. Full House – Same Colour – A great hand where you need to have to roll three of a kind and a pair (for example 3,3,3,5,5), but you also must have numbers of the same colour. If you can achieve this you will score an extra 20 bonus points plus the total of the numbers on the dice. Full House – This is when you have rolled three of a kind and a pair as shown above. You will get the total of the dots on the dice and also an extra 15 bonus points. Flush – If you manage to roll all the same colour on five dice, you score 35 points. Straight – A straight is when you roll sequential dice numbers, for example, 1,2,3,4,5,6. If you manage to do this, you score 30 points. 2 pair – Same Colour – This category is slightly different to the others. To score in this category you must roll either 1,1,6,6 – 2,,2,5,5 – 3,3,4,4 and the fifth leftover die can be of any kind. To work out your points here, you must add up the total of all dice . When you are playing in the Kismet Section of your scorecard, you can obtain bonus points dependent on where you score. If you score a minimum of 71 and no more than 77 you earn 55 bonus points. If you score 78 or more you earn a bonus of 75 points and this can make a huge difference to your score at the end of the game. In Kismet, the player with the highest score overall will win the game. You are not allowed to score any bonus points if you roll five of a kind more than once. Only the first time this happens is it allowed to count. If you’ve already scored a ‘Kismet’ then you can use the next one as a ‘joker’. This means that you can then score in any category on your score sheet that is open. If you are playing in a large group of people and score a second Kismet, this means that all the other players need to take a zero in the first open category in either basic of kismet sections. They will also lose a turn, so scoring a second Kismet can be an invaluable if tricky roll of the dice.